On October 3rd, Don Lindsay, one of the icons of professional hunting in Africa, passed away after a long fight with cancer. He always exhibited the profoundest belief that sustainable and regulated hunting was an important conservation tool in Africa. Don was a founding member of the Professional Hunters’ Association of South Africa (PHASA) and served PHASA almost a decade as president. He was also one of the founding members and long-time president of the International Professional Hunters’ Association (IPHA) as well as an important contributor of expertise and knowledge and founding director of Conservation Force, contributing to initiatives such as the Bontebok and the Black-faced Impala. Apart from his membership in professional associations he was a member of Shikar-Safari Club International, Safari Club International and numerous other hunting associations. Don Lindsay was born in Johannesburg and educated at the venerable institution of St John’s College. In his formative years he spent much time in the veld as the youngest member of the Witwatersrand Bird Club and one of the youngest members of the Wildlife Society of South Africa. He studied pasture management and soil conservation at the University of Natal capping his studies with the thesis “Wildlife – A Crop Off The Land”. Don was a true pioneer and played a pivotal role in promoting the concept of science based sustainable use of wild natural resources, and that incentive-driven-conservation can contribute substantially to wildlife prospering and incentivizing rural people to preserving wildlife habitat. Don Lindsay’s fictional novel “Win the Wild”, with an introduction by one of South Africa’s foremost conservationists, Dr. Ian Player, ingeniously explains the birth and growth of the game ranching industry in South Africa, and how wildlife became an asset of the land, thus saving marginal lands for conservation by replacing livestock with wild game. John Jackson of Conservation Force said pointedly that “Don knew first-hand the force of hunting and talked the talk like few others. His contribution to hunting and conservation was immense”. I met Don many years back in the early 1980s when my family and I arrived in South Africa. His infectious smile and stories from the early days of hunting in Botswana, where Don was one of the old-time bwanas, who had hunting rights over an immense concession of 90,000 square miles, held me captivated more than once. 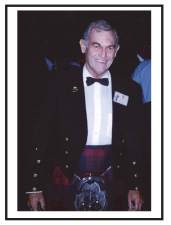 His signature kilt and proud Scottish heritage were the highlight of many gala evenings in Africa and overseas, and he could entertain crowds like no other at auctions when he swung the gavel. The entire hunting community will miss you Don – Fare Well, my friend.